I bought a label maker. 2017 is a wild time to be alive. I really thought those things had to be at least $40, but no. 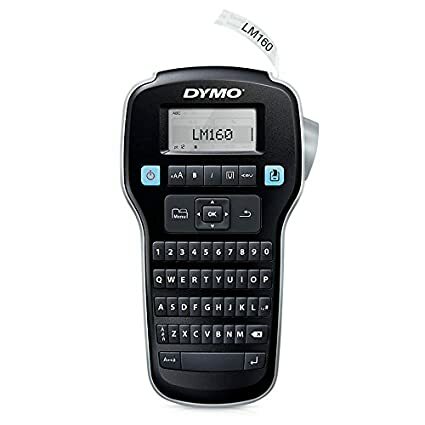 Two clicks on Amazon and the most amazing label maker was delivered to my doorstep two days later for $10. Which means, my pregnancy-induced OCD has shifted to overdrive. Do I need to label each blanket in my closet organizer? Probably not. I'm sure I can discern a swaddle from a burp cloth by looking at it, but, you just can't be too sure. The completion discount was only 10%, I thought it was 20%. Then, they didn't have our car seat in stock. Then, I couldn't find the crib skirt I registered for. Then, I started crying in the baby monitor aisle. Why? Who knows. That's when Austin starts getting what I like to refer to as 'tear-induced-panic-syndrome.' I dare you to imagine a more cliche scene than a pregnant lady crying in Buy Buy Baby with an empty shopping cart and a panicked husband. We left. I ordered everything I needed online. Umm, why didn't I do that in the first place? Because I am pregnant and my sense of logic and reason is as distant a memory as my high school body. RIP high school body! Remember that time I didn't appreciate you? I'm sorry. Then, there are the really tough decisions...like whether to buy the freaking Owlet Smart Sock. I SWEAR when the baby 'stuff' industry is coming up with a new invention, they have a bar graph with a sliding parental guilt scale. THAT'S how they decide if this thing is going to make it on the market. For those of you who raised a kid when 'car seats' were the hot new baby safety item on the market....I'll explain the Owlet. Darwin's best work. Survival of the absolute fittest. An Owlet smart sock is this tiny little baby sock that monitors your baby's oxygen level and heart rate. It sends you an alert on your smartphone if either of those drop below acceptable levels. Why? Because of SIDS. Sudden Infant Death Syndrome. If you want to really scare the neighborhood parents, don't dress up as Dracula or a zombie from the Walking Dead for Halloween this year...just wrap yourself in a poorly tied swaddle blanket that can come loose and suffocate you and watch the neighborhood moms shriek in terror. Spoiler alert...we're buying the Owlet. 6 more weeks-ish to go. I don't think time could move any slower at this point. 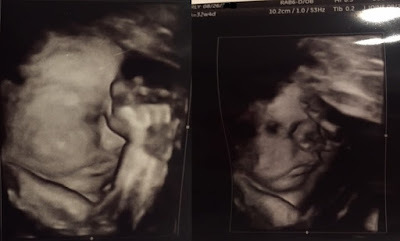 We're so ready to meet you, John Michael! (Your foot feels like it's a size 8 already in my rib cage, so it feels like you're probably ready to get out of there and meet us, too.) See ya on the other side! We'll be the ones waiting with an Owlet and way too many labeled swaddle blankets.